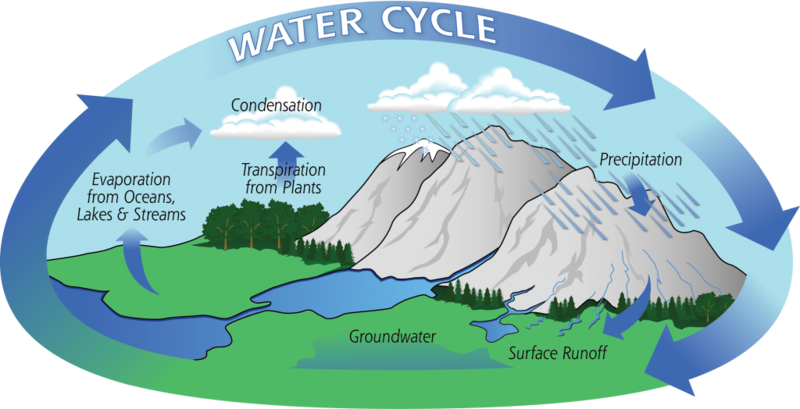 Rain falls to the ground, nourishing plants, supplying drinking water, etc..
Water seeps into the ground or runs off into creeks and rivers if the ground is saturated. Water returns to the sky from these large bodies through the process of evaporation. With the water back in the sky, the cycle begins again. Certainly there are more details we could give, but that is the basic cycle. Rain is not the only thing that has come down from heaven. Whether it be in the age of the patriarchs, during the time of Moses, through the period of the prophets, or now in the New Testament era, God’s word has proceeded from above. And like the rain, He has sent His word for man’s benefit. Some will tell us God speaks to them directly. In times past, God did speak directly to man, but Hebrews 1:1-2 tells us He now speaks through His Son. The writer goes on to say the word which the Lord spoke was confirmed to us by those who heard Him, that is, the apostles (Hebrews 2:3). These men recorded the Scriptures as directed by the Holy Spirit (2 Peter 1:20-21). The apostle Paul used the Greek word theospneutos to describe the origin of Scripture. It is “God-breathed” (2 Timothy 3:16). Every time we read the Bible, we are listening to that which has come from God’s mouth. It is comforting to know the Bible is not the product of man’s wisdom, but is God’s wisdom revealed to the world (1 Corinthians 2:4-5). God does not whisper in the ear, but has given a written record which has endured through persecution and remains to this day (1 Peter 1:22-25). The water which falls to the earth does not return to the sky until it has accomplished what God sent it to do. The same is true of His word. He sent His word to save souls. Being sown into the hearts of men (Luke 8:11-15), the word of God results in souls being saved (James 1:21). Paul said the gospel is God’s power to save (Romans 1:16), and Peter said all who obey it discover “times of refreshing” (Acts 3:19). Though it is given to save souls, not all souls will be saved. The fault does not lie with the word—not all will respond favourably to the free gift of salvation in Christ Jesus. However, all who obey the Lord’s word will be saved. What a wonderful promise to read! If we receive the word of God and walk according to it, it will prosper in our lives. But what does that mean? Jesus said if we will hear and believe, we will have everlasting life and will not come into judgment (John 5:24). How do we not come into judgment? In another place, He identifies the word as the means by which we will be judged (John 12:48). If we know the word and are obedient to it, we will stand in judgment and be received into heaven. When we open the door to God’s word in our lives, we will be made more like God. Jesus said the word will sanctify us (John 17:17). In Ephesians 5:26, we are pictured as the bride of Christ, “…cleansed with the washing of water by the word.” As we give ourselves as a home for the word of God, it will become a fountain of life in us (John 4:14), able to overflow and affect those who are around us. Hebrews 4:12 speaks of God’s word as “living and powerful.” It is not dead and ineffective. If we will allow it, the Bible, like a sword is able to prune the dead works out of our lives to make us better servants of the Lord (John 15:1-2). Friend, may we realize how truly blessed we can be with God’s word in our lives. It is the word of life—the voice of God to His creation in order that we might be made right and ready for eternity in heaven. Heed the voice of God, let His word dwell in you and prosper your life. This entry was posted in Faith, God, Prophecy, Truth. Bookmark the permalink.